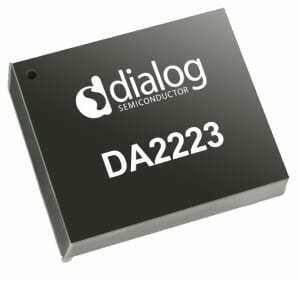 Energous Corporation today announced the availability of its DA2223 receiver chip, which is the latest addition to its family of integrated circuits. At just 1.7mm x 1.4mm and less than 0.5mm thin, the DA2223 4-port RF-to-DC wireless power chip is the smallest RF rectifier IC in the Energous technology portfolio. Depending on the device power level, a complete WattUp wireless power receiver can be realized using a single DA2223 IC coupled with a matching circuit made from two standard discrete components and a tiny 2mm x 3mm antenna, which itself can be formed using simple printed circuit board tracking. Such a small form factor makes it suited for use in small electronic devices where a coil-based wireless charging system is not practical. “At just 1.7mm x 1.4mm in size, the DA2223 was designed for very small form factor applications like True-Wireless Stereo earbuds, hearing aids and wearables, which we expect to be a large part of our revenue ramp from 2019,” said Stephen R. Rizzone, president and CEO of Energous Corporation. “Partnered with Dialog Semiconductor, we continue to innovate turnkey solutions that increase our competitive separation from older, first generation coil-based solutions. Energous and Dialog are leading the advancement of next generation wireless power technology and paving the way for the global build out of the wireless charging 2.0 ecosystem,” Rizzone added.